I don't know what has gotten into these people, but it would be funny if it were not so serious. First, the Pople comes out and thinks that if we just ban weapons there will be no more fear of war. Then a teacher from Marjory Stoneman Douglas High School referenced student Kyle Kashuv as "the Hitler type" in a discussion with another student about the discussion that took place on Twitter between the teacher and student. If you recall, just last week, I reported on the fact that the cowards in the Broward Sheriff's Department, as well as the school resource officer, confronted and interrogated Kashuv after he went to a gun range and posted all he learned on Twitter. It seems that the only people the cowards in Broward have any courage to confront inside a school is an unarmed kid. Now, one of the teachers at the school attacks Kashuv by referring to him as "the Hitler type." A Parkland, Fla., history teacher allegedly called a pro-Second Amendment Jewish student “the Hitler type” and “dangerous,” according to a Friday report. Marjory Stoneman Douglas High School teacher Gregory Pittman allegedly made the remarks about junior Kyle Kashuv in class when a student mentioned a Twitter dispute between Pittman and Kashuv, reported Fox News. Pittman allegedly made the comments during a class in which Kashuv was not enrolled. At least three students told the junior that the teacher said he was the “next Hitler,” according to the Sun Sentinel. The Twitter dispute precipitating the alleged remarks started when Kashuv posted a video and photo documenting his first gun shooting experience with his father, an Israel Defense Forces vet. So, though Kashuv was not in the class, the teacher thought it permissible to speak about him in such a fashion. This is becoming typical cowardice in Broward County. However, at least three student did verify that Pittman did make the comments. So, what's going to happen to Pittman? Right, Ms. Drew. How seriously are you taking the harassment of Kashuv by the school's armed school resource officer and the Broward County sheriff's deputy last week? How seriously will you take this latest incident? The public surely can't have any confidence in the leadership there in Broward County. As for Pittman, he tried to justify the school's actions of interrogating Kashuv. “After a mass shooting at a school, you don’t have to be the sharpest tack in the box to understand when another student posts a photo of an assault weapon why school security personnel and police might ask questions,” tweeted Pittman. Funny, Pittman apparently gets to defined what an assault weapon is. Does he own any semi-automatic rifles or handguns? Other people, like Senator Dianne Feinstein, consider those to be assault weapons. However, no, I don't understand why a kid who has defended the law, the Second Amendment, should be interrogated. He committed no crime. He assaulted no one. He threatened no one. IF anything, he informed the mush brain, non-critical thinking kids like David Hogg and Emma Gonzalez from the school about what the Second Amendment is about and why it is necessary to protecting God-given rights of the people to keep and bear arms. Remember, Kashuv said that was his first time firing a gun and he learned a lot. There was no need to ask questions. What is amazing is that Pittman doesn't question those same people as to why Nikolas Cruz was not arrested and charged after numerous threats and assaults, but he doesn't do that. Nope, he attacks the kid who is actually standing up for the Constitution and the rights of Americans. Pittman should be censured for his actions and summarily fired from his job due to the fact that what he was presenting was not only an attack on a student, but was clearly a false historical comparison. Kashuv is promoting gun ownership. Hitler promoted gun confiscation. 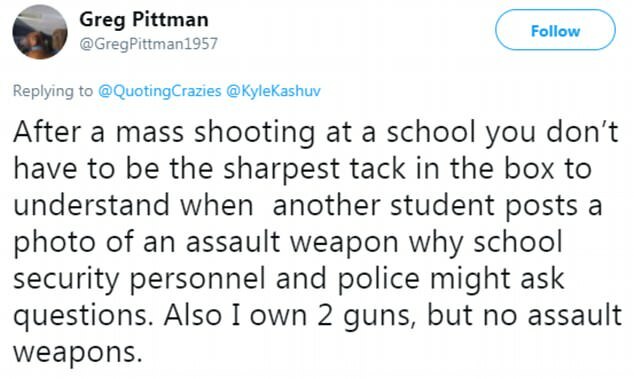 If Pittman were honest, he would have applied "the Hitler type" to David Hogg, not Kyle Kashuv.